Drawing on scarce archival material, the author has assembled for the first time a detailed account of the evolution of the valley from open farmland to leafy residential enclave, together with a precise chronology of the development of the valley’s roads and buildings. Also revealed are the men responsible for the transformation: the absentee landlords, the land speculators, and the empire builders who, while outwardly praising and publicizing the serene beauty of the valley, saw it as little more than a colonial outpost ripe for settlement and financial exploitation. 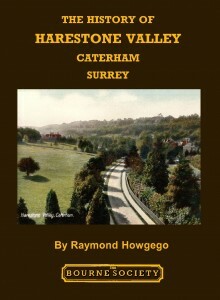 The 70-page A5 book, illustrated with 35 old photographs and eight early map reproductions, covers the whole of Harestone Valley from Harestone Hill in the east to Underwood Road in the west, and from Caterham Station in the north to Dome Hill, War Coppice Garden Village and Viewpoint in the south. Separate chapters deal with the valley’s major buildings and institutions, and with projected developments that would have forever altered the character of the valley but which thankfully never took place. Copies of the book are available for £5 by collection from Ray Howgego at 39 Harestone Valley Road, or from the East Surrey Museum on Wednesdays, Thursdays and Saturdays. Alternatively, the book may be ordered for £6.50 including postage from the Bourne Society’s publications officer, Paul Redington, at 13 Crewes Avenue, Warlingham CR6 9NZ.